I went back and forth as to whether my Friday Favorites really needed numbering and in the end decided to stick with it. I figured if I ever needed to go back and reference a particular one, this would make it a million times easier! This week, my Friday favorites are mostly beauty related (surprise, surprise!) with a treat thrown in for good measure, so let's get to it. If I had to tell you just one thing to purchase from the Balm, it would most definitely be this blush in Hot Mama! And that is really saying something because I LOVE the Balm's makeup! I think it's pretty obvious by now what types of blushes I like to wear this time of year (peachy, pinky with a gold shimmer) and this one, dare I say it, is my favorite of the bunch. It is shimmery without being glittery, the perfect color for EVERY skin tone and looks so super natural you'll look like you've just been for a run (in a good way!) You can get it for $20 on The Balm's website but I've seen it for way less on Ebay and Amazon. I've linked it here and here. This e.l.f. baked highlight in Moonlight Pearls was one of my very first e.l.f. purchases and as we all know, I haven't looked back since. This is my favorite highlight! No matter how often I stray and try out new ones I always come back to this. It's a gorgeous champagne color and it gives the most beautiful glow to the skin. Of course, it's super affordable since its e.l.f. and it is probably one of the best purchases I've ever made from them. You can find it here. It does go out of stock quite often so keep your eyes peeled! This liquid eyeliner from NYC is most definitely not everyone's cup of tea, but it's one of my favorites. It is a brush applicator which can be quite hard to work with if you're new to eyeliner or pretty klutzy (I am, but it doesn't stop me, just use a little makeup remover to clean up if you need to!) It is the best, blackest, most dramatic eyeliner I've ever used and when I'm feeling like a bold wing I always reach for this. I just get this from Walmart and it's super affordable. I've linked it here. I've talked about this brand and both the scrubs and body butters time and again but this one in Tropical Mango is most definitely my favorite of the scrubs. I don't know what it is that makes this scent's formula different from all the other scented scrubs, but it's a lot coarser, which I personally prefer, especially this time of year as I'm wearing tons of sandals and heels so my feet need a little extra love. This runs about $5 and lasts a good while. I generally get mine at Walmart but in a pickle I've gotten it off Amazon, which I've linked here. Last but most definitely not least has been my favorite coffee drink lately. I generally just like black coffee, but in the warmer months I can never resist a good frozen drink. This one has Irish Cream, white chocolate, and whip cream so it's absolutely delicious! 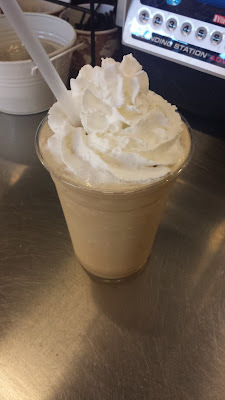 Let me know if you guys would like some frozen coffee recipes in a future post or if you're in my area, stop into my coffee shop and I'll make you one personally! I hope you guys had a great week and remember to let me know what you've been loving lately! Great post as always Kim! I'm unfortunately not going to get time to post my summer bucket list today, things have been so crazy! But a few on my list are: going to the beach, going to the drive in, cleaning out my closet and donating anything I don't wear, practice yoga more frequently, and go to an amusement park. Thanks so much for the nomination, and I'm sorry I couldn't get the time to make this an actual post. Hope you have a lovely weekend gorgeous! OK Kim, I am getting on a plane now just to come have that frozen coffee drink with you, Irish cream and white chocolate are two of my favorites! Yes yes yes, please give us some recipes I am sure you have some of the best ones out there and I'll bet you're coffee shop is such a gem of course like you my dear lady! I tried to NYC eyeliner and I really like it as always more make up going on my list from sweet Kim ha ha! Have a wonderful weekend my beautiful friend! Wouldn't it be great if we could just fly whenever we wanted to have a cup of coffee with a friend? Definitely dream goals right there hahahaha. I will definitely do a post of some of my favorite coffee recipes, it's just trying to pick which ones hahaha! Tell me about it! I go to Target to literally HUNT down some of the items you post. And now Gordmans! Hahahaha! You are my favorite Andrea, have an absolute glorious weekend! XO -Kim. I need both that blush and that highlight now! But seriously, I have so many products from The Balm so I'm a little sad I don't own that already- it's SO pretty! Also, I didn't know you partly owned a coffee shop, that's so cool!